Catalog Page 10. Order 9" Q-Tee Stuffed Animals. Promotional stuffed bears, dogs and koalas. Catalog Page 10. Order 9" Q-Tee Stuffed Animals. Promotional stuffed bears, dogs and koalas. 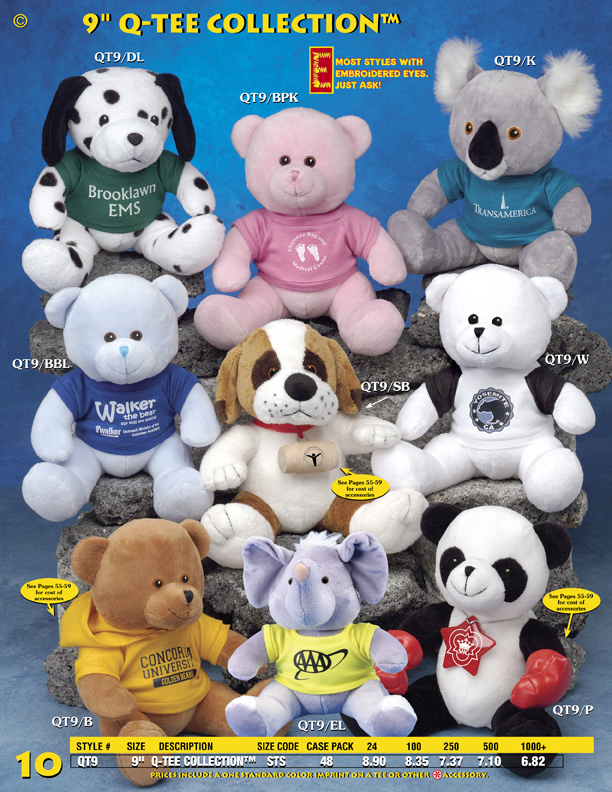 There are four pages of stuffed animals that belong to the 9" Q-Tee Collection. Choose from St. Bernard dogs, Dalmatians, bears, elephants and cows. The pricing above includes the one-color printed t-shirt or accessory. You can mix and match animal styles to meet the minimum order quantity. The lead time for production is 10 -14 days.